Our school took part in the Active School Week again this year. We took part for the first time last year and really enjoyed it. We have lots of PE during the year but we spend most of Active School week doing new activities. we were lucky that we had good weather for our Treasure Hunt again this year. We started each morning with Bizzy Breaks in the GP room and then each room did their own activities throughout the day. Here’s how Niall described our first day. “Today was our first day of Active Schools Week this year. This morning we went down to the P.E. hall to do our Bizzy Breaks. In Bizzy Breaks first the music starts off slowly and we do slow stretches. Then it gets faster and we run on the spot, bounce up and down, sidestep and lots of fast movements. 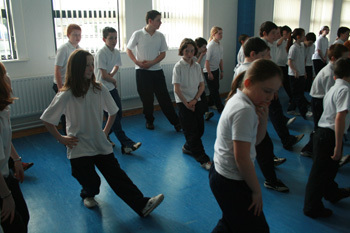 Then the music slows down again and we do more slow stretches to cool down. Its loads of fun. 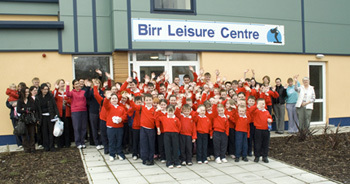 At 10.30 two buses came to bring all the children in school to Birr Swimming Pool for a fun session. Most of the 5th and 6th class went to the deep end, the 1st to 4th classes were in the middle part of the pool and the infants were in the shallow end. We played with balls and some plastic rings that sunk to the bottom of the pool. We had lots of fun trying to get the rings from the bottom and there were lots of floats to play with too. It was brilliant fun at the pool but unfortunately we had to go back to school. We had a brilliant first day of our Active week.